Len Frank, respected automotive journalist, magazine editor and veteran co-host of “The Car Show” on radio KPFK-FM, the nation’s first call-in car program, has died at the age of 60. Frank, who had suffered from colon cancer for 2 1/2 years, died Friday at his home in Long Beach. “I doubt if there was anyone who had more information in their head about the history of cars, their design, automobile racing and the car industry,” said John Retsek, his broadcast partner since 1977. “As a person, there wasn’t a kinder, more generous person beneath his image of cynic and curmudgeon. Frank, born in Youngstown, Ohio, was a two-career achiever. In his early years, he sold imported cars in California and Ohio, raced cars, rebuilt cars, managed car dealerships, and for a year studied transportation design at the Art Center College of Design in Pasadena. So began an obit for my late friend Len Frank in the Los Angeles Times, on the occasion of his passing in mid-1996. 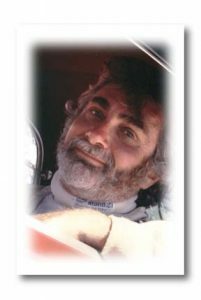 Len was many things, besides those noted above, he was also a father, a college prof, and the best damned automotive writer I ever read, met or knew. Any one of us that grew up reading car magazines (and still read them and/or writes them today) has their favorites, the ones we love, and the ones we sometimes loved to hate a little bit. Len was a Motor Trend staffer during some of its better years, as I later was, although we were never on staff at the same time. When I was a budding wannabe freelancer cub, Len was one of my mentors. We sat down over several long dinners and he made suggestion of how I could break into the business; I was working and thinking more as a photographer at that time so he asked if I’d be interested in shooting some of the cars and events he was writing about for magazines. Which I did, and just by spending that time with him, working on cars and projects, he taught me a lot about the game, which helped me break in. So many things contributed to Len’s greatness and talent. To begin with, he really knew and loved cars. He had a critical eye, but not a jaundiced one; he could drill down into the essence of a vehicle, to determine its real value and goodness, or lack of either, irrespective of brand or origin. He taught me to understand why some cars and brands everyone thought were great, just weren’t always, and why some cars you’ve never heard of were fabulous and often undiscovered. His knowledge of automotive history, industry, design and all that was far deeper than Google’s. He was deeply well read, on nearly any subject you could and couldn’t name. And he had a crafty, clever sense of humor. All of which combined to spawn a magically good and wonderful writing style. I was in awe of him because he had the same dictionary of words that I did — but why were his stories so much better than I could write? I still wonder this. When Len passed away his son Stefan entrusted me with Len’s archive of copy, floppy discs, scribbled upon yellow legal pads, and photos. The Petersen Automotive Museum now has custody of these original materials, so I know where it all is and that it’s safe. I have much of that work in digitized form, and vow to you (and myself) now to someday publish it into a book, or post it all up as a website in his honor and memory. Because everyone should read and enjoy Len Frank’s marvelous work, and talent like this should never be forgotten.